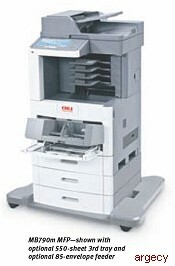 Looking for Oki MB780 & MB790 Parts? Leasing Available from $50.34 per month! Leasing Available from $110.12 per month! Leasing Available from $80.58 per month! Leasing Available from $19.65 per month! Leasing Available from $12.87 per month! Leasing Available from $10.37 per month! Leasing Available from $14.31 per month! 1Published performance results based on laboratory testing of letter-size simplex sheets. Individual results may vary. 2Finisher/Stapler on MB790f and 100-sheet mail bin on MB790m. 5Based on ITU-T Test Chart #1. 7Requires optional hard disk drive. What the medium workgroup demands in a MFP. These black & white MFPs pack a lot of paper and toner- dramatically reducing down-time from user interventions: up to 3,200 pages of paper capacity4(with options), and high-capacity toner cartridges capable of lasting for up to 36,000 pages3. They're also designed to be easy and simple to use, with intuitive and customizable controls. Sharing files and documents is a snap- Place your document on the flatbed platen or in the 75-sheet duplexing automatic document feeder (DADF) and scan both sides in a single continuous pass. Save and send the electronic version to a folder on your PC, the network or FTP site, as an attachment to an e-mail address, or to a USB memory stick. Preview scans on screen- Before you scan and e-mail an important image file, see how it looks and fits on the page.7You can preview your scan on the 9" color touch-screen display, saving you time and eliminating errors. Manage traffic efficiently- When you e-mail a large file it won't cause a traffic jam on your network. That's because the MB700 MFP Series' traffic-shaping technology can partition your network traffic and designate lower bandwidth for outbound flows. This is especially useful for busy networks and externally hosted Web servers. Robust copy and fax features - Benefit from a rich range of advanced copy functions to boost your users' productivity, such as Priority Copy to interrupt long print runs temporarily; ID Card Copy to copy both sides of a card onto a single sheet; and Sample Copy to proof the first copy set before printing the remaining copies. MB700 MFP models also offer powerful fax features, including broadcast faxing, 500 speed dials with LDAP support, and fax memory of up to 900 pages5. Personalized user settings- The MB700 MFP Series lets multiple users save and re-access their personal settings on a simple flash drive, including their local address book, personal fax numbers, individual copy settings, and even their own touch-screen configuration. They simply walk up to the MFP, slide in their flash drive and the MFP literally transforms into their own personal device. Finish with a flourish- Choose the MB790f to staple multiple sets of documents of up to 50 pages each. Or organize your output with the 4-bin mailbox on the MB790m, which lets you assign each bin to a different user or a dedicated function- like one for incoming faxes, one for copies and one for regular output.